There are many things you can learn about the nature and habits of Portland cyclists simply by looking at what they are buying throughout the year. One thing that has stood out to me at our shop in recent years is that, along with fenders (for obvious reasons), higher-end lights are always in top demand in the fall. While most people seem content to use inexpensive lights in the summer, the fall seems to bring out those who are serious about riding their bikes year-round and who really want a light that will be durable, water-resistant, and– above all–bright. So for the convenience of all of you who may consider yourself to be one of these intrepid commuters or late night riders, the Community Cycling Center offers a wide selection of super bright commuting lights that have an array of options and features to suite your needs. But if brightness and affordability are your primary concerns, look no further than the Metro 550 by Cygolite. Looking purely at the lumens (550) to dollar ratio, the 550 gives you the most value for your money. When I bought mine last year, I was so excited to have an affordable light that actually illuminated the road, I wanted to write a stellar review right away. But, to be honest, I was pretty skeptical of this light simply because it was so significantly cheaper than all other lights on the market with comparable light output—I figured they had to be cutting corners on something. However, having regularly used this light for over a year now, I can confidently say that this light is well worth the $85. I have ridden with it in down-pours, I’ve dropped it countless times, I have completely drained the battery, and yet it still works great and continues to be my primary light. The Metro 550 is USB rechargeable and has a run time of about 1.5 hours to 30 hours, depending upon the light setting you use. With my use, I find that I need to charge the light about once a week. My favorite setting is the “SteadyPulse” which essentially flashes to alert motorists while maintaining a constant beam of light to keep the road lit in front of you. My one complaint about this light is the mount needs to be tightened every so often and tends to be a bit sticky when removing the light. However, with Cygolite lights, you can purchase additional handlebar mounts, which makes it easier to switch their lights between bikes. I wouldn’t necessarily say that the Cygo 550 is the best light on the market, or even at our shop. But if you are looking to get a powerful light without spending too much of that hard earned cash, give the 550 some serious consideration. Be safe and enjoy the “off-season”; it’s not going anywhere for a good while. 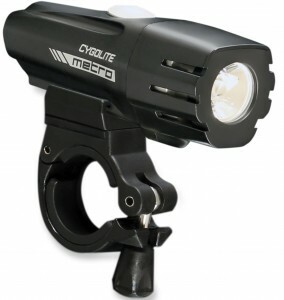 If you’re looking for something a bit smaller and less expensive, check out Cygolite’s Streak 310 ($60), or if you are looking for a much brighter light that also comes with a replaceable battery cell, then check out the Expilion 800 ($152), also from Cygo.